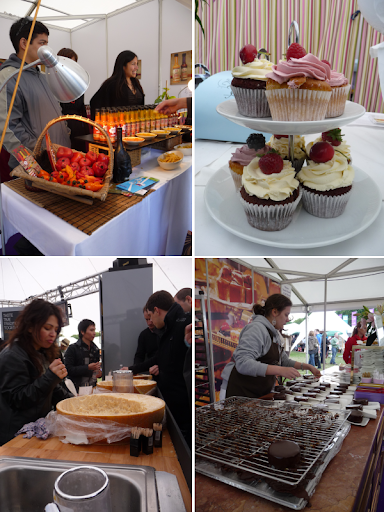 If you're a Londoner and interested in food, you will have definitely heard of the "culinary event of the year" (or otherwise you might have been hiding under a rock, ice cream van, sushi platter or similar...), the Taste of London "exhibition" which took place last weekend. Unlike most food bloggers who are drooling around the net, sharing praise like chocolate-covered ants (yeap, those usually don't go down well, as a colleague discovered when she brought some to the office and someone almost threw up after not realising what it was and having one – but I digress! 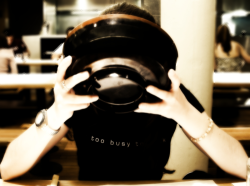 ), I am not really a Taste-of-London-aholic. I attended last Christmas' event, imaginatively named the "Taste of Christmas" and again this summer's Taste of London, only because I was lucky to win tickets for it both times. The tickets included £15 worth of crowns for two, so in total £30 which is a nice amount, especially since it was free and it was to be spent solely on food. Now the only gripe I have with the Taste of London and similar "paid" events, is that, although it charges exorbitant amounts of rent to the exhibitors, the organisers subsequently charge equally exorbitant amounts for the attendants' tickets. £22, which was the cheapest available pre-booked and non-offer ticket, buys you "just entrance", and if you want to eat or drink anything substantial, that's extra. In order to boost profits even more, a special currency (called "crowns") is used, which is essentially little bits of paper you exchange for real money, as in some stalls you can only pay with those (in others you can pay with "real" money, but if you want THAT specific thing, which is not sold with "real" money, you just HAVE to have crowns to get it). I admit you get to try a few freebies, from interesting producers and suppliers that otherwise maybe you wouldn't have the chance to see gathered in one place, but you can do the same in the Borough market, Broadway market, or Covent Garden food market (to mention just a few) without paying for entrance. Having experienced this twice, I know I wouldn't pay the price, as for the same money you can go to any of the restaurants advertised (at least if you're in London) and pay the same. Seriously, the whole deal is that "you can sample dishes from restaurants that you would otherwise maybe not afford", but that is also a bit of a hoax. Example: I wanted to try Salt Yard's famed Courgette Flowers stuffed with Goats Cheese and drizzled with honey. They were £5 a plate (or rather the equivalent in "crowns") and it was actually 1 courgette flower stuffed with goats cheese and drizzled with honey. Now I've never been to Salt Yard, and I appreciated the chance to try this dish in an "al fresco" (i.e. freezing at 10°C) environment, but I found it a bit weird that the same dish is actually £7.40 in their menu, and I'm pretty sure it's not a single courgette flower that they serve (whomever has eaten it at the restaurant, please, please tell me how many flowers there are!). So, in a few words, Taste of London is NOT cheap, you can get the same things for almost the same price (or better) elsewhere, but there's the "festival atmosphere" and chance to try new things for free that weigh on the pros side. Now that my whining is over, I can tell you what I tried. Apart from the aforementioned courgette flower, we also had some steak from Salt Yard (ok, but have had much much better, even from ASDA), lots of prosciutto di parma, parmiggiano (where I heard the monumental conversation "what cheese is this?" "Parmesan" "And which country is it from?" – Come on besuited man with totally unsuitable shoes for a park, you paid more than £30 to come and eat here and you don't even know what...Parmesan is?) and the rest of the money was spent on little treats. 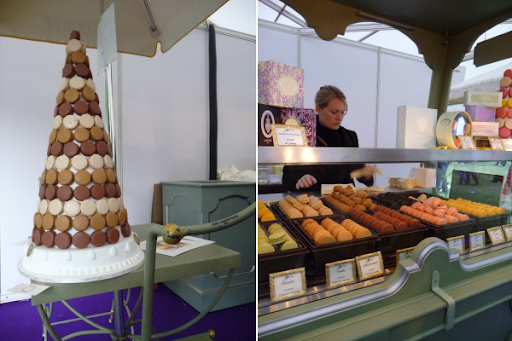 I got a coconut and a lemongrass macaroon from Ladurée (my partner got a chocolate and a raspberry one) and we both ate little bites off each others'. The lemongrass one was divine, the rest I wasn't too impressed by, but then macaroons are not my favourite thing in the world (ice cream is, which I couldn't eat as it was so freezing cold in the park!). We also got two chocolate truffles from Paul A. Young's stand at the end of the day, a quick way to spend our remaining crowns with something of excellent quality as usual! A slice of banana cake followed, a big sweet loaf (to take home) and a small Sachertorte from Demel (in the second photo from the top), which was a bit too sweet for my taste, and not as moist as I expected. But the star buy of the day was a £5 truffle from Azienda Agricola San Pietro A Pettine. This was a black summer truffle the size of a ping pong ball, and these are the most affordable kind, if it had been a winter one it would have taken all our crowns to buy it! I have bought truffles before, from the Borough market, and this was great for making two dishes for 2 people, of which I decided the first one would be a wild mushroom and truffle risotto, not a very summery recipe, but since it was so cold this weekend it went down really well, followed by some cuddling in the sofa with our feet covered with a blanket (hope a "continuous" summer starts soon!). I had already bought some pretty wild mushrooms from the Borough Market on Friday, which were yummy and gave some extra woodiness to the risotto, but if you can't find any fresh ones you can use dried ones, soaked for 30 minutes in hot water, and then you can use the soaking liquid as part of the stock base (don't forget to pass it through a sieve first). Clean the mushrooms gently with a brush. Heat 3 tbsp of the butter in a large non-stick saucepan and fry the mushrooms until they have released their juices. Add the rice and fry for 2 minutes over a medium heat, stirring until well coated with the butter. Add the wine and simmer until absorbed by the rice. Gradually add the hot mushroom stock to the pan, a ladleful at a time, stirring between each addition to allow the liquid to be completely absorbed (it should take around 30 minutes). Stir in the Parmesan and last 2 tbsp of butter, serve and shave the truffle very thinly over the risotto (I used a vegetable/potato slicer, but a really sharp knife might do the job too). Add Fresh cut corn to this risotto. You won't regret it! I have heard similar reviews to the festival and that it was over priced, that is too bad.